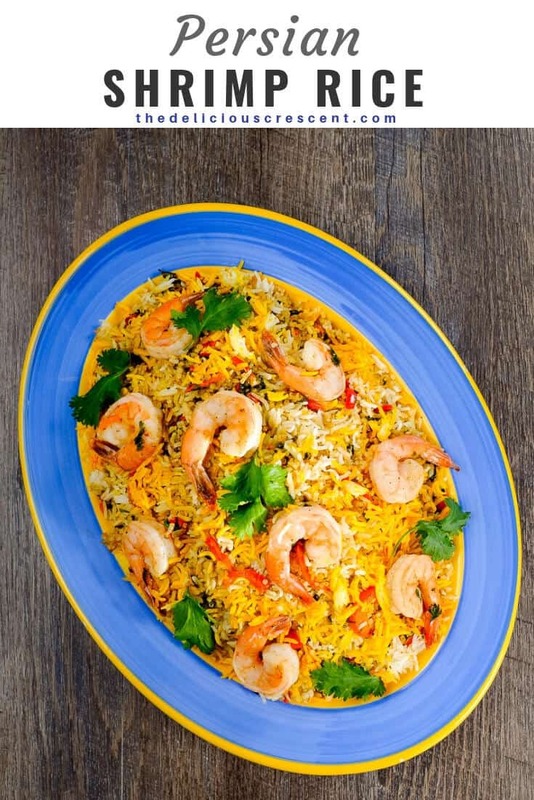 Persian shrimp rice with quinoa is an easy and healthy recipe with loads of flavor from curry powder, spices, red peppers and herbs. It is a great option for weeknight meals. Having grown up in a rice eating culture, I know very well how rice eaters can be choosy about the type of rice they eat. Try to convince them to eat all brown rice for better health and quite often it will not work. I experimented with a neat trick. That is – to substitute the white rice in this recipe partly with whole grains – brown rice and quinoa. The long white basmati rice grain texture still remains dominant, retaining much of the familiar taste aspect of the dish. That is at least half the battle won, right? You must definitely try this! 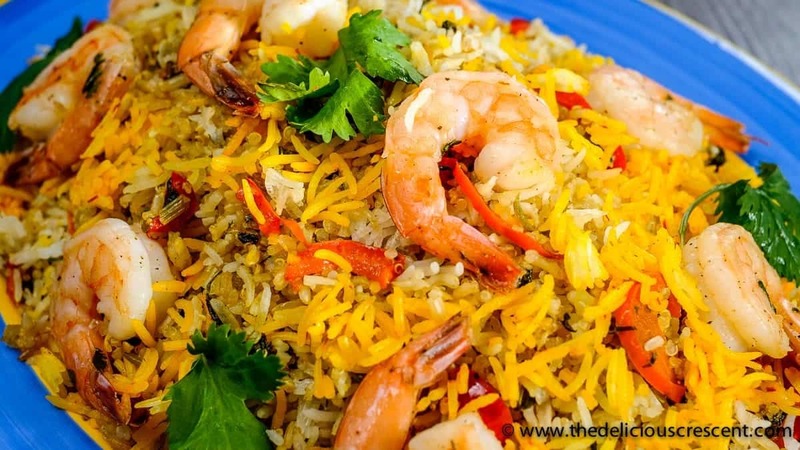 This Persian shrimp rice is a really flavorful preparation. Packed with tasty nutrient rich herbs and nicely spiced. Add to that the plump juicy shrimp. Oh, so tempting! Shrimp are not only delicious but are also a good source of nutrition. They are pretty low in calories, rich in protein, selenium (supports antioxidant activity) and vitamin B 12. They are a good source of omega 3 fatty acids, phosphorus, choline, copper and iodine. People have often worried about the high cholesterol content of shrimp. However, blood cholesterol levels are more influenced by the saturated fat intake rather than dietary cholesterol. And shrimp are pretty low in saturated fat. That said, those who have high blood cholesterol levels, should follow their healthcare professional’s personalized diet advice tailored to the specific situation. Also, keep in mind that some people may be allergic to shrimp. Traditionally Persian rice recipes include the preparation of a rice crust in the bottom of the pan. You can check it out in this post – Saffron Yogurt Rice with Spinach and Prunes. Brown rice takes a longer time to cook and I personally prefer to cook it following the method I mentioned below. 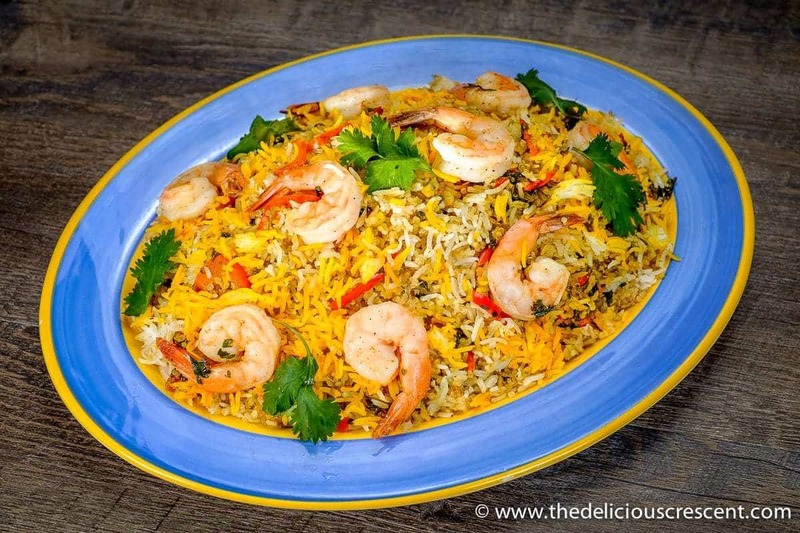 But if you would like to use a rice cooker for the white rice and the remaining steps, you could check this post – Easy Hyderabadi Chicken Biryani. I write a lot of detail into my recipes, but if you read carefully you will see that this is a very easy recipe. 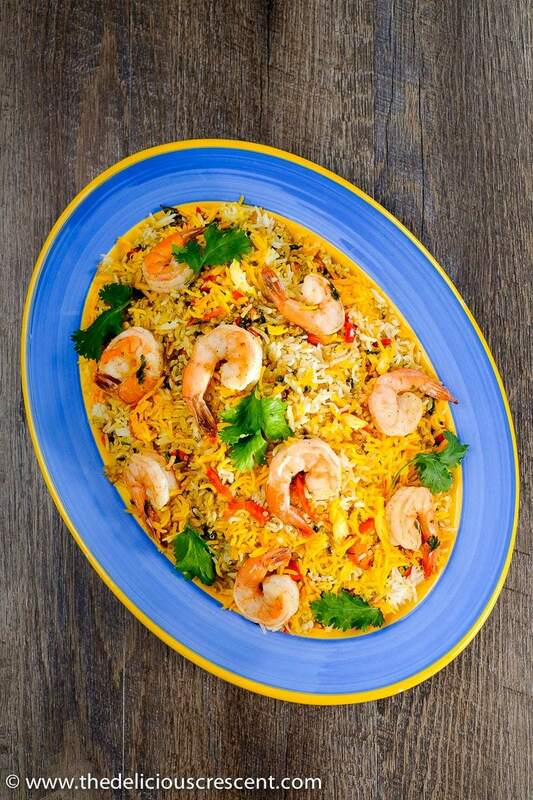 And if you are a shrimp lover like me, then you are in for a big treat with this Persian Shrimp Rice ! Bring 3/4* cup of water to a rolling boil in a sauce pan. Add 1/8 teaspoon salt and 1/2 tablespoon olive oil. Then add 1/2 cup brown basmati rice, stir and bring it to a boil. Lower the heat and allow it to cook until all the water is absorbed for about 30 to 40 minutes. Bring 1 cup of water to a rolling boil in a sauce pan. Add 1/8 teaspoon salt and 1/4 tablespoon olive oil. Then add 1/2 cup quinoa, stir and bring it to a boil. Lower the heat and allow it to cook until all the water is absorbed for about 20 minutes*. Bring 3½ cups of water and 3/4 tablespoon salt to a boil in a cooking pot. Add the white basmati rice and let it boil at medium high to high heat for 5-6 minutes until the rice grains are soft. Make sure to stir the rice while it is cooking. Drain the rice well in a colander and set aside. Heat 1½ tablespoons olive oil at medium setting in a cooking pot. Add the chopped onions and sauté few minutes. Then add the grated garlic and continue to sauté until the onions are light golden brown. Add the sliced red bell pepper and sauté. Next add the shrimp and sauté for a minute. Then add the curry powder, red pepper flakes, turmeric, cumin, black pepper, 1/3 teaspoon salt, the herbs, and stir it all. It should need only a total of 4 to 5 minutes, until the shrimp start changing color and curl a little bit. Do not over cook the shrimp. Pick out the shrimp and reserve to arrange the shrimp over the rice while serving. Use the sautéed onions and herbs as in the next step. Place the rice-quinoa mixture with the sautéed onion/herbs/spice mixture in several alternating layers in a heavy bottomed cooking pot. Sprinkle 3/4 tablespoon oil, saffron water and lemon juice all over. Turn up the heat to medium high for about 10 minutes and then reduce the heat to the low setting and simmer for about 20 minutes or more until the steam builds up well. Once the rice is ready, turn off the heat. Gently serve the herb rice. Arrange the shrimp all over. Garnish with fresh herbs. Serve this Persian Shrimp Rice with a yogurt salad such as Persian Yogurt Dip with Shallots, pickles and/or pickled olives. Bring 3¼ cups water to a boil. Add 2/3 teaspoon salt and 1½ tablespoons olive oil. Add the brown rice first. Simmer for about 20 minutes. Then add the quinoa and white basmati rice to the same pot. Let it all simmer till the grains are well done. Proceed with the remaining steps as above. But skip sprinkling the 3/4 tablespoon oil after layering the rice-quinoa with the sautéed onion/herbs/spice mixture. 1. I used 1½ times volume of water to cook the brown rice. But if you need double the volume then try that, as it can vary with the age of the rice. 2. For cooking quinoa, check with package instructions as well. 3. Cooking time and water used for white basmati rice may vary with the age of rice. 4. Rinse the basmati rice several times, until the water is clear and not starchy. 5. The amount of water added while cooking the rice is very important to the final texture of this recipe. 6. It is important to keep in mind the additional moisture from the other ingredients added to this Persian Shrimp Quinoa Herb Rice, such as the shrimp, herbs and onions. Therefore, in the first step, the rice should be cooked in a way to yield a fluffy rice, but holds its shape well and is not too wet and delicate. 7. I prefer the first method for this Persian Shrimp Quinoa Herb Rice recipe as I can control the cooking of the various grains optimally. *The sodium value for shrimp used was from the USDA national nutrient database which is based on retail market shrimp that typically come in contact with sodium solutions during processing. The sodium value may vary if using fresh untreated raw shrimp. The suggested amount of salt is just a guideline and may need to be adjusted. Check for any added salt in spice mixes and other ingredients and adjust. 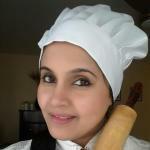 Tried this recipe?Mention @thedeliciouscrescent or tag #thedeliciouscrescent! Mmmm, I love a dish using all the great spices of the world. This is a dish I would really enjoy. I am with you on that Janette. I love using spices. This looks like something my family would love and I could see it becoming a weeknight regular. I love how you put all that detail in your recipes especially when it’s something I’m not used to making like this! This is an easy dinner to make during the week! Perfect for busy weeknights! I love these flavors! The perfect dish for spring! Loving all the spices in this! We eat a lot of shrimp around here so look forward to trying it! I love shrimp too. Thanks Lisa. Hope you enjoy it.